I have ‘known’ Gandhi ever since I can remember. It all started with my grandmother who, running her home with my doctor grandfather in villages and small towns of what later became Tamil Nadu, was anonymously and intimately involved with the freedom struggle. She stopped wearing silk saris at the behest of Gandhi when he visited Pollachi, and donated what gold jewellery she had been wearing for the war effort. She and my grandfather sat at the charkha daily. In between they tended the gardens at home and at the hospital, and provided a sanctuary to injured four-legged creatures and lovelorn or convalescing nieces and nephews. 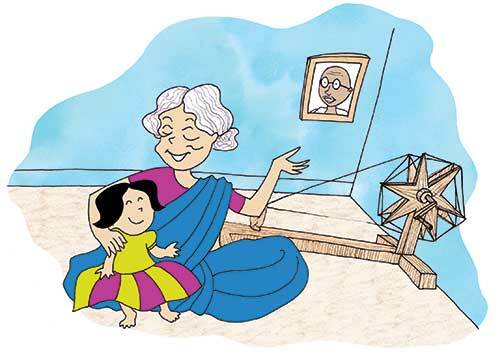 My mother and her older brother were too young for the charkha. So they, like a lot of other children, spun yarn on a takli (a small, portable spindle). My grandmother told me stories about the British, Gandhi and independence. She was married at 11 but all her life, she listened to the news on the radio/transistor. She was a political person, even though she had had just a couple of years at school; she schooled herself. She had barely any possessions, she kept herself and her surroundings spotless, she was busy every moment, even in her quiet times, and she simply would not tolerate injustice or telling lies. That’s how huge the mythology is around this person who was as real and as practical as one can get. In fact, when he said, “My life is my message”, he wasn’t being boastful or ingenuous. It really is. Which is why I believe Gandhi’s experiences and experiments offer many teaching and learning opportunities. I am neither an educationist nor a Gandhi scholar, or in any way qualified to comment on his philosophy of education. But there are some gut feelings I’d like to share, simply by virtue of having read, and continuing to read, all kinds of writings/commentaries about this remarkable individual. Of course, no one was as prolific about himself, as in his thoughts, ideas, arguments, as he himself. Luckily, too, there are still people around who have personal anecdotes to share. For instance, my mother recalls how, as a student of Vidyodaya, a pre-eminent school in Chennai, which was very much influenced by the nationalist movement, she was part of a group assigned to sing ‘Vaishnava janato’ at a Gandhi public meeting on Marina beach. The girls practised diligently and for days, and they put their hearts and souls into the singing only to be ticked off by Gandhi for the rather overly soulful-bordering-on-doleful rendering! In a recently published book called The Living Gandhi: Lessons for Our Times, edited by Tara Sethia and Anjana Narayan, there is an essay by James O’Toole called ‘The Practical Idealist: Gandhi’s Leadership Lessons’. In it he talks about how in South Africa, over the course of two decades, Gandhi acquired the practical skills of leadership by reflecting on experience – which, in a sense, is the thrust of this article. His study of various religious texts led him to formulate his own set of values: “What he learned in the process was to desire ‘the welfare of others’. This became the basis of a philosophy that might best be described as ‘humanism’.” And this is the philosophy that drives all his concerns, including education. For instance, he was a votary of learning multiple languages – Persian, Arabic, Hindi, Sanskrit, English, and of course, the mother tongue. For a multilingual society such as India, what could be more useful than to be able to communicate directly with as many people as possible? Or his unshakeable faith in the power of manual labour not just to build character and self-reliance, but to learn? The principles at the heart of this philosophy remain relevant to the Indian condition, even as the incidents relating to his life provide examples of values that are timeless. Who can argue with the need for truth-telling, good hygiene, self-sufficiency, self-belief, willingness to learn and change? His philosophy promotes a holistic approach (bringing together head, heart, and hand), it emphasizes manual labour (learning by doing), it underscores the crucial role of the mother tongue (the natural medium of instruction), and gives importance to education being self-supporting. In the process, it holds the possibility of eliminating mindless rote-learning, bestowed upon us by the colonial system. So, how do we make all this mean something to small children? We cannot expect them to be Gandhi, even though come October 2, the most popular fancy dress ‘costume’ is Gandhi – such an irony! Here too, we have Gandhi’s own example. While they were still in South Africa, the children’s education was an issue because Gandhi didn’t want them to enjoy any privileges, so he didn’t send them to the best school, and he was not satisfied with what else was available. He made the children walk with him (8 km up and down) to his office in the city while he instructed them, and at his office he gave them reading and writing assignments. Once, poor Manilal forgot his glasses at home, and he had to walk all the way back home to pick them up and then go back again. These big and small ideas certainly have a place in our classrooms today. Most of all, Gandhi is about ideas and the power of ideas. As one class teacher said to a class of very restive students: “I’m not asking you to love each other, but you don’t have to hate either!” The times have changed, we have to adapt, but the fundamentals remain strong and consistent. Basically, forget the mahatma. Remember the stories, even the adverse or controversial ones. Nor do all our stories have to be about Gandhi because we have ‘mahatmas’ all around – ordinary people doing extraordinary things, quietly. That’s the real relevance of Gandhi today, in the classroom and outside it. The author is a journalist and children’s writer based in Chennai. She believes in stories, real and imagined. She can be reached at <sandyrao99@gmail.com.